We will see you in Chicago at ICST soon! To register for the conference, please follow this link. Hotel reservation link will be provided to you as part of your registration. The conference will be held in Holiday Inn Chicago-Mart Plaza River North, a top- notch hotel that offers spectacular river and city views. Located in downtown Chicago’s exciting River North area and minutes from Chicago's Loop, the contemporary Holiday Inn Chicago Mart Plaza Hotel overlooks the Chicago River and showcases iconic views of the Chicago skyline. Defined by urban style and modern comfort, a recent $45 million redesign of this property sets the stage for an exciting Chicago experience for both business & leisure travelers. Ideally situated near the Magnificent Mile, Navy Pier and Millennium Park, the Holiday Inn Chicago Mart Plaza is the perfect base from which to explore Chicago. Catch a rising star in the nearby Theatre District, walk over to one of the myriad dining options just steps from the hotel or watch the sunset at Willis Tower before retiring to your guest room featuring breathtaking views of Chicago. You can read more about the hotel and what if offers here. Conference participants will be offered discounted rates. We plan to make the conference registration system and hotel registration codes available by the early in January 2016. Chicago’s O’Hare airport is an international and North American hub, with direct flights from nearly every other major city in the world, served by all US and international carriers. With the sustained high traffic level in and out of O’Hare, prices are typically competitive for all itineraries. Chicago’s Midway airport provides regional service primarily aimed at cost-conscious travelers. The proposed conference site can be reached from either airport on public transportation in less than an hour for about $3. Chicago is also easily accessed via highway or rail. Low-cost bus seats are popular with students seeking inexpensive transportation from campuses within 800 km radius. Many modes of intra-urban transportation are available, including low cost public rail and bus (CTA and METRA), rental cars, and taxis. These cover the metro area and are available 24/7. The city has recently created many miles of bicycle lanes in public streets. You will find a nice set of directions for getting from the airport to the hotel at http://www.martplaza.com/maps.cfm. The train (subway/elevated) is the cheapest option and not difficult to use. Moreover, if you are planning to travel around Chicago it is a good option for that. You can buy individual fares, or multi-day passes giving unlimited rides. See http://www.transitchicago.com/ for details. Chicago offers a broad and deep selection of cultural, dining, entertainment, and sports attractions. Here are just a few: the Chicago Symphony Orchestra, small clubs for authentic Chicago Blues, many live Jazz clubs, the Art Institute, the Museum of Modern Art; the Second City comedy review; hundreds of restaurants for dining in almost every international cuisine, Chicago Hot Dogs and Pizza, and many exclusive and expensive five star restaurants. In April, the Cubs and Sox play baseball; the Bulls are on the court, the Blackhawks are on the ice, and the Chicago Fire is kicking goals. Chicago is home to many iconic buildings and architectural movements, including the first skyscraper and modernist exemplars. Restaurants A glance at Zagat's reveals the enormous variety and number of restaurants in the city. To find ones that are near the hotel, you can look there under the "Neighborhood" "Near North,” where 112 are listed. Things to do The Chicago Visitors Bureau has a page giving details on many things to do in the area. The following is a very short list, based on reports from participants in past IEEE/ACM conferences held in Chicago. Millennium Park is a 15-20 minute walk from the hotel. Nice landscaping and architecture, good place for people watching. Blues. 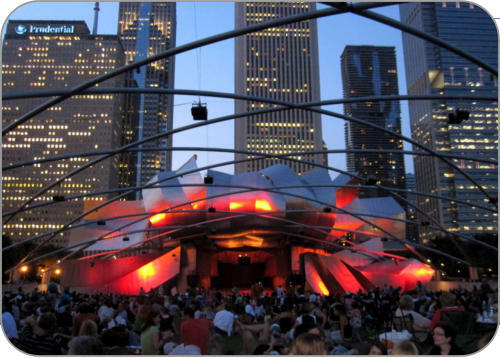 Chicago is the birthplace of urban blues and offers a wide range of venues. Blue Chicago is a 10-minute walk from the hotel. There are actually two of these within three blocks of each other. See the web pages for shows and times. Buddy Guy's Legends is a cab or subway ride away from the hotel, larger than Blue Chicago. Jazz. You can hear live straight-ahead jazz most nights at the Jazz Showcase and other lesser-known clubs. Chicago Symphony Orchestra. The CSO is one of best orchestras in the world, now under the artistic direction of Ricardo Muti. There several performances every week and some seats are usually available on short notice. Museums. The Art Institute of Chicago is part of Millennium Park. The recently renovated Museum of Modern Art is a about a mile away, just off of Michigan avenue. The Field Museum has an amazing collection of natural history and is adjacent to the Shedd Aquarium and the Planetarium. On the University of Chicago campus, the Oriental Institute (spiritual home of Indiana Jones) holds a large and unique collection of Assyrian and Babylonian artifacts. The Museum of Science and Industry in Chicago is excellent; and has recently opened a Harry Potter exhibit. See: http://www.msichicago.org/whats-here/exhibits/harry- potter. Advance tickets are available, but popular shows mean you might want to get tickets soon! Baseball. The Chicago White Sox and the Chicago Cubs will be just starting their seasons. The Cubs are venerable team in a venerable old stadium. You might need to use Stubhub to get tickets ahead of time though. You can easily get to either ballpark by subway. Theatres. Improvised sketch comedy was developed at The Second City , which has launched hundreds of well-known actors and entertainers. There are dozens of live stage theaters that present everything from Greek Tragedies, to Shakespeare, to Mamet. Shopping. The Magnificent Mile (Michigan Avenue North of the Chicago River) is one famous if pricey place to shop. Or watch people. Many other venues equally interesting. Architecture Tours. Boat tours on the Chicago River with docents who describe architectural features of the city depart several times daily at the intersection of Michigan Ave and the Chicago River. There are many other walking tours. Frank Lloyd Wright’s Oak Park Studio and many of his iconic Prairie Style residences are less than an hour from the city center. Home of ICST 2016 And More! Chicago is a world-class venue for meetings of all kinds. It hosts millions of visitors and a wide range of commercial, technical, and professional meetings every year. It was the site of the 2012 NATO and G8 summits. ISSTA 2009 with Gregg Rothermel as the general chair and ISSRE 2006 with Bob Binder as general chair were held here. Six schools in the metro area grant the PhD in computer science, electrical engineering, or information technology: University of Illinois at Chicago, Northwestern University, University of Chicago, Illinois Institute of Technology, DePaul University, and Loyola University. There are dozens more within 800 km of the city. 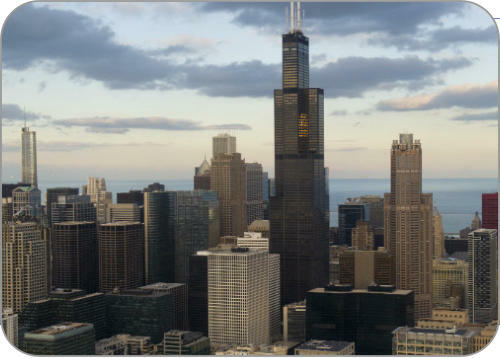 Chicago has a strong industrial base of established and start-up information technology companies, including Alcatel-Lucent, Motorola, Tel Labs, Google, Groupon, Options Express, and 37 Signals.